What can happen when your baby has it? What tests might your baby have? 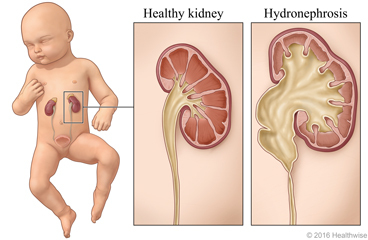 Fetal hydronephrosis is swelling of a baby's kidney caused by a buildup of urine. This can happen while the baby is still in the mother's uterus. Doctors often find the problem when a woman has a fetal ultrasound during pregnancy. Urine normally travels from the kidney down a narrow tube to the bladder. This narrow tube is called the ureter. The urine drains out of the bladder through another small tube called the urethra. A kidney may swell if your baby's ureter is blocked and urine can't flow from the kidney to the bladder. Or your baby's kidney may swell if urine that's already in the bladder flows back up into the kidney. For many babies, this condition goes away just before or after the baby is born. Kidney swelling that is present after your baby's birth may be a sign of a kidney problem. It might also be a sign of a problem with your baby's ureter or bladder. These problems could lead to infections or other kidney issues. After your baby is born, your doctor will do a test to see if there is still a problem. If a problem is found, your baby's doctor will do more tests. These tests help the doctor know what type of treatment your baby needs. Ultrasound. This test helps the doctor look at your baby's kidneys and bladder. It can show if the swelling is getting better. Renal scan. This test shows how well your baby's kidneys are working. X-ray. This test shows how well your baby's bladder is working. Voiding cystourethrogram (VCUG). This is an X-ray test. It shows how your baby's bladder and urethra are working while he or she is urinating. If your baby's kidney is still swollen after birth, the doctor may give your baby antibiotics. This can help prevent infection. Your baby's doctor may talk to you about surgery to correct a blockage problem. But this would only happen if the problem is severe. Most babies will not need surgery. Enter P504 in the search box to learn more about "Learning About Fetal Hydronephrosis".